If you love cooking with cast iron, this would be a great deal to grab! This would also make a great holiday gift idea for someone on your holiday shopping list! You can get this Lodge Cast Iron Round Griddle for only $12.99 today! You will be saving 46% on this purchase because it is normally $24.00! This griddle measures 1/2 by 10-1/2 by 15 inches and comes with a limited lifetime warranty. This griddle comes pre-seasoned for you as well. It comes with a sturdy handle with hole for convenient hanging when not in use. Make sure that you grab this deal soon because the prices can change at anytime on Amazon! 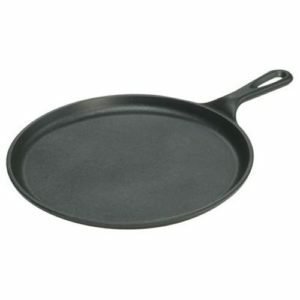 CLICK HERE TO ORDER the Lodge Cast Iron Round Griddle for only $12.99 today!